In September 2014, we celebrated the Society of Friends in Youghal, their origins, their involvement in the business life of the town, the social life of the town and we get to know the families of the Quakers and some of the prominent personalities. By way of introduction to the Society of Friends we offered some background . This snippet is from Christopher Moriarty, of the Quaker Historical Library in Dublin. The snippet was first published by RTE by way of introduction to a “Who do you think you are?” program. We will, later, include the family names of the Quakers in Youghal – names like Fisher, Harvey , Pim etc. 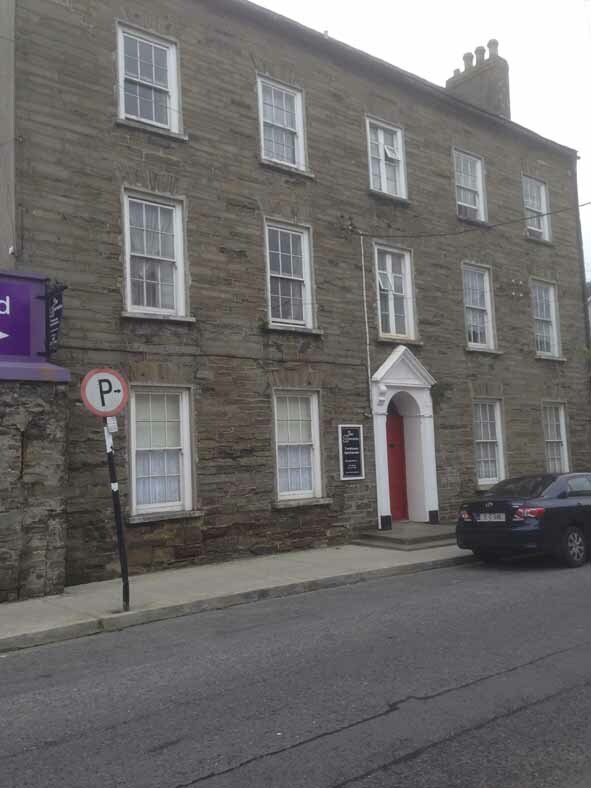 Harvey’s Dock is a prominent place name in Youghal and the Harvey home was a fine residence in its day. To day it is let out in apartments but the Harvey family name survives with the dock. It became an RIC barracks for a while and was the subject of an attack by the forces led by Michael Collins during the Irish Civil War. We will let you know of the work of the Quakers during the Great Irish Famine and other moments in their history in Youghal. The Society of Friends or the people known as Quakers. Quakers are a Christian sect with a relatively short history. The founder was the Englishman George Fox, a charismatic thinker and preacher who died in 1691 at the age of 67. As a young man he had sought advice on his spirituality from numerous members of the clergy and had failed to be satisfied by any of them. The background was one of notorious corruption amongst the clergy and deadly combat between Catholic and Protestant. A great many people shared Fox’s problems and left their churches in search of something better. Known as ‘Seekers’, they followed several paths and a number of new Christian bodies were born. One of these was George Fox’s Society of Friends, nicknamed ‘Quakers’ at an early stage. Several essential Quaker tenets came to be established in the first few decades of their existence as a distinct group. The spiritual basis was direct contact between the individual and the Holy Spirit, leading to what may be regarded either as a priesthood of all believers or as the absence of priests. It also embraced a belief in the presence of God or of an ‘inner light’ in all people – no matter what their religion. A key statement of Fox expressed the ideal beautifully To walk cheerfully over the world answering to that of God in every man. ‘Man’ in the context most emphatically embraced male and female and a distinction of Quakerism from its earliest times was its emphasis on equality between men and women, especially in the spoken ministry. The Bible, with much more emphasis on the Gospels than on the Old Testament, provided a written basis and some of the teachings of Jesus became central. To ‘love thy neighbour as thyself’ led to a refusal to take up arms in any conflict. To ‘let your yea be yea and your nay be nay’ meant truthfulness at all times. This caused problems. Quakers refused to take an oath and this, especially during the times of 17th century civil warfare in England and Ireland could be regarded as treasonable and did lead to many imprisonments. A number of Quakers settled in Ireland, in the aftermath of the Cromwellian warfare. One of the most active amongst them was William Edmundson and the first known Meeting for Worship in Ireland took place in his house near Lurgan, Co. Armagh. The movement spread widely and, by the end of the 17th century, many Meetings were established in the Provinces of Ulster, Leinster and Munster. To a Quaker, worship is an unending process: life is a sacrament and therefore no separate sacraments are observed. As knowledge of the divine is a matter between the individual and God, every person has a different approach to the truth and there is no written credal statement. The fact that this has never led to anarchy is explained by the early development of a hierarchical system of meetings. The present day structure has been altered to some degree from the early times but the essentials remain the same. All Quakers in Ireland are entitled to attend the governing Yearly Meeting. Its rules, however, are to deal with procedure, not belief. There are three Quarterly Meetings, one for each of the three original Provinces. Below them are seven Monthly Meetings, each somewhat similar to a diocese in extent. And finally there are thirty local meetings, corresponding to parishes. Decisions take at these meetings must be accepted by all participants. The duty of the Clerk, who presides, is to seek the ‘feeling of the meeting’ on every matter of business and immediately record it in a Minute. This is read to the meeting, amended if need be and finally agreed. Such Minutes have carefully preserved and they are a major component of the Quaker archives, now housed in the Friends Historical Library in Dublin. Many Quakers hold that all human activities are spiritual and refuse to distinguish between sacred and profane. Others accept the wider Christian view that there is some division between the ‘world’ and the ‘spirit’. But, whatever the theological nuances may imply, the Quaker ethos has had a profound influence on the day to day lives of its adherents. The first generations of Quakers in Ireland acquired farms or shops and formed a closed, and sometimes misunderstood, community. Their principles of fair dealing with all people led to respect as good employers. The ruling religious authorities of the time saw them in a very different light. The law required the annual payment of substantial tithes to the clergy of the established protestant episcopal church. Quakers, on principle, refused to pay and this resulted in their goods, especially the produce of their farms, being seized by ‘tithemongers’. These ‘sufferings for the truth’ were reported to and set down by the Monthly Meetings. The manuscripts have been carefully preserved and provide modern historians with a remarkably detailed inventory of farm produce and household goods in the 17th and 18th centuries. A desire to lead a simple life with no excesses, combined with a deep conviction that theirs was the one true religion and a rather puritanical approach to life in general had important results which, once again, have been the basis for significant documentation. Breaches of the moral code frequently led to ‘disownment’, expulsion from membership of the Society. ‘Marriage before a priest’ was forbidden, with the result that Quakers who married into any other sects ceased to be recognised as members and their names disappear from all subsequent records. Bankruptcy was another cause for disownment, on the grounds that it led to failure to honour undertakings and harmed the creditors. While the process in the case of marriage was short and swift, that relating to bankruptcy and other actions was more protracted and involved a careful examination of each case, with great efforts being made to help and, if possible, rehabilitate the defaulter. Many of the views on morality were held in common with other Christians. Others were distinctly narrower. Gambling was utterly forbidden, as were payment of tithes, participation in music and dancing and joining any army. Records of no fewer than seven thousand and thirty-two disownments have been catalogued. The practice virtually ceased towards the end of the 19th century at the same time as Quakers became increasingly liberal in their attitudes. The 20th century witnessed, for the majority of Irish Quakers, a much greater concentration on the original ideal of recognising ‘that of God’ in every person. The testimony against bearing arms remains as strong as ever, but modern Quakers enjoy most aspects of modern living. The days of disownment for the possession of a piano have long gone. While the strict and somewhat inward-looking ethics and behaviour of the Quakers continued through the greater part of the 19th century, notable developments had begun in the 18th century to take place both in care for disadvantaged people of all faiths and in industrial development. The former included the relief of suffering in 1798, active participation in the anti-slavery movement and relief work in the Great Famine and at other times of hardship. Quaker entrepreneurs were pioneers in the textile and milling industries. Millers by and large had an evil reputation for cheating their suppliers and an honest miller may very well have attracted a wide custom. It is possible that the strictures on land-owning and entering the professions imposed by the Penal Laws had a positive effect in directing Quakers into industry. Families such as Davis, Going, Shackleton and Smith were amongst the leaders in the trade. Ship-owning and ships’ chandlery were followed by a number of Waterford families. Members of the Bell family initiated one of the great shipping lines. William and Robert Jacob invented a ship’s biscuit with great keeping powers, vital food for long voyages. They went on to found the biscuit empire. The Bewley family became leading importers of tea and coffee and went on to found the chain of restaurants. In all of these success stories, careful attention to quality and fair dealings were a key factor. Two of the most remarkable industrial achievements of the 19th century were the textile empires of the Malcomsons in Co. Waterford and the Richardsons in Co. Armagh. The Malcomsons were pioneers in applying new technology to cotton spinning and the Richardsons did likewise in the linen industry. In both cases the social consciences of the entrepreneurs were to the fore. The Malcomsons built a village with comfortable houses in Portlaw for their workers, as did the Richardsons in Bessbrook. The meticulous record-keeping of Quakers shows that, at the end of 2008, members of the Religious Society of Friends in Ireland numbered 1,535, an increase of one over the previous year. The numbers over the past decade have been almost constant. A majority of members, though not all, attend Sunday meeting for Worship regularly and find it both an occasion of spiritual uplift and a social gathering of friends. Men and women members of each meeting are appointed to see to the welfare of all, especially in cases of sickness. Births, marriages and deaths continue to be carefully recorded. Individual Quakers, or small groups, play an active part in a variety of social concerns outside the Society. The Northern Ireland troubles saw impressive developments in promoting peace between the opposing factions and in taking significant measures in seeing to the welfare of prisoners. By their nature unobtrusive, no one can tell how many lives were saved by these activities. Reconciliation work continues, especially in facilitating encounters between adults and children of both sides. Quakers have joined in with other religious groups in facilitating the Alternatives to Violence Programme in prisons and in setting up visiting centres at prisons. A recently formed group called ‘Why violence ?’ is working to introduce the concept of keeping some proportion of air-space on television free from scenes of violence. Peace committees are active in several meetings and many members are actively involved in charitable and social work both in Ireland and abroad. Concern for the environment is promoted by an ‘Eco-Quakers’ movement. Until well into the 19th century Quakers, in their search for simplicity, retained archaic forms of speech and of dress besides imposing a repressive code of behaviour. Those days are long gone and the modern Quaker is outwardly indistinguishable from his or her fellow men and women. The ‘cheerfulness’ advocated by George Fox, together with concern for the welfare of all people remain an integral component of the Religious Society of Friends in Ireland. An excellent introduction to Quaker beliefs and practice is Maurice J. Wigham’s The Irish Quakers, second edition published in 2007 and available by post for €13.50 from the Historical Library, Quaker House, Stocking Lane, Dublin 16. Visit www.quakers.ie for details of Quaker activities past and present.